Pointwise now includes the ability to read native CAD files from ACIS, CATIA V4, CATIA V5, NX, Parasolid, Pro/ENGINEER, SolidWorks, and STEP formats in addition to the IGES and discrete formats it has always supported. This capability is included with every Pointwise license at no additional cost and is based upon the 3D Kernel_IO libraries licensed from CT Core Technologies. Figure 1: CT Core Technologies is a leading developer of CAD interoperability software. Working without a license of the CAD software, the readers import CAD data directly into Pointwise's geometry kernel, bypassing the possibly error-inducing step of creating a neutral file. The native CAD readers work seamlessly with Pointwise's Solid Meshing technology and can import existing solid models from the native CAD file or automatically assemble solid models during the import process, the models providing a means of ensuring watertight geometry and mesh. Pointwise users benefit from fewer CAD translation errors and less time spent in cleaning up CAD geometry problems. 3D_Kernel_IO handles assembly structures, attributes like names and layers, as well as entities like points, curves, and B-REP solids. Native CAD import works with Pointwise's Solid Meshing and Fault Tolerant Meshing to reduce or eliminate entirely CAD repair and cleanup. 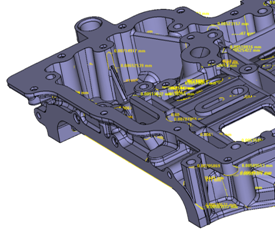 It is common now to read CAD files that are immediately ready for meshing without any time spent fixing CAD problems. Figure 2: 3D Kernel_IO provides direct access to native CAD in many formats. Founded in 1998, CT Core Technologies is a global leader in the CAD interoperability market. By focusing on this critical technology and investing 35 percent of revenues in research and development, they have achieved a 20 percent annual growth rate. In addition to the 3D Kernel_IO libraries used in Pointwise, CT Core Technologies offers 3D_Evolution, a CAD conversion, healing, and defeaturing package, and 3D_Analyzer, a CAD viewer and collaboration tool. For more information about CT Core Technologies, visit the company website at www.coretechnologies-inc.com.